A wool master from Siena, Sano di Maco would have been familiar through the Benincasa family business. He was a member of the Dodici, giving him political power that many in Catherine’s spiritual family held. After the Dodici was overrun in 1371, he did not hold a political office until 1385 when he was elected to the Consiglio Generale. He was a member of the Compagnia della beata Vergine Maria (joined in 13651, a powerful group aligned with the hospital, he became prior in 1377, 1378, and 1380. 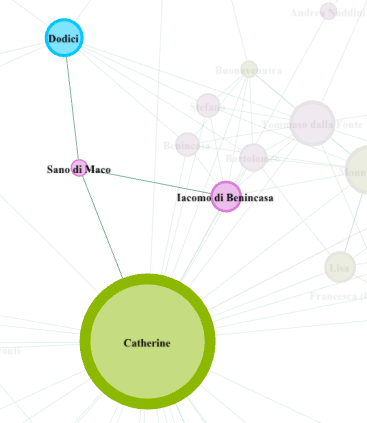 Sano di Maco was a devoted follower to Catherine and helped deliver messages for her to Siena. Catherine used rhetorical strategies in her letters to Sano to persuade the Sienese people that she was not a problem and was only focused on spiritual matters. She is constantly reminding him of her spiritual nature, reinforcing her mother trope, and telling him of her ambitions to only focus on saving souls. Her letters to Sano support the notion that Catherine’s letters were meant to be read out loud to others. As a local political figure, Sano had the capability of spreading Catherine’s words to calm the Sienese people’s concerns over her actions.